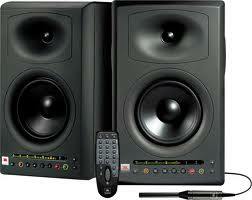 These are the best monitors I have ever used for mixing. They are extremely accurate. Built well. These monitors have 2 high power amplifiers that put out 150 watts of power to the low frequency transducer, and 70 watts of power to the high frequency transducer. These are really sophisticated. They are perfect for people recording and mixing in home studios that are not sound treated. They have an on-board system called Room Mode Correction, an on-board system that automatically compensates for low frequency anomalies measured at the mix position. They will automatically analyzes and correct the response of each speaker in the room. I were able to use these twice at a friends studio. They are really amazing and sound wonderful. The high end is crisp and the low end sounds perfect. They cost around $1,100 at Guitar Center.